Gonser’s Good News Trail — Really? 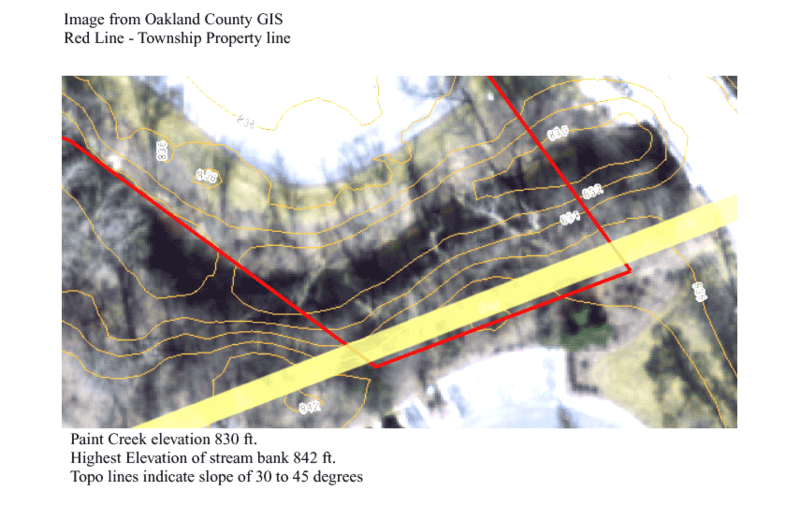 On July 9, 2013 Supervisor Gonser announced the “Good News” that the Township would build a trail to connect the Paint Creek Trail to the Paint Creek Cider Mill on Oakland Township land adjacent to Flagstar Bank. It will be in conjunction with a Road Commission of Oakland County project to replace the Orion Rd. bridge over the Paint Creek just north of Flagstar Bank. The proposed bridge will have a safe pedestrian lane. Here’s a video of his announcement. It must have looked good on paper. But wait, did Gonser stop and look at the Township Land where he will build his good news trail? Here is an aerial image showing the topography of the land. This image shows that the stream bank where the trail would be excavated is 12 feet high and has slopes up to 45 degrees. It is almost a certainty that the Michigan Department of Environmental Quality will not permit this trail. There is also a problem with information provided by Gonser to the Road Commission. To include the pedestrian lane, the Road Commission must have a commitment from Oakland Township to build a connecting trail. Gonser told the Road Commission that the commitment was contained in the Goodison Plan (which was total derided by the Board and definitely not approved at the July 9th meeting). The Trustees have never discussed this trail. Upon hearing this the Road Commission became concerned and asked for a meeting ASAP. There is a controversy with the meeting. Gonser wanted the meeting to be private with only 3 Board members attending. Two of the excluded Trustees have forced it to be a public Board meeting. Here is the meeting notice . It will be Wed. 7/31/13 at 10 AM. Hope to see you there. This entry was posted in Trails and Safety Paths and tagged Terry Gonser on July 29, 2013 by foulkrj.